Yeah I love all this stuff!! If we don’t get it in IX, I hope RJ’s trilogy will go there… fingers crossed.. I wold love to see any holocrons in one of the movies – they haven’t really gone mainstream movie and I love all this stuff! Indeed – please Lucasfilm! I can imagine Dryden’s sith holocron being in IX. I can imagine lots of things haaaaa.. I was at the shops today and had a quick flick through the Solo official guide – it said Dryden was intending to donate the Sith Holocron to someone – I can’t remember the exact words, but I’m left with the impression he was going to gift it on eventually – maybe he intended to gift it to Maul… but I could see Crimson Dawn (Qi’ra or not) gifting it to Kylo Ren in IX to gain favour. Anything is possible! I think it’s great there are so many collectors – and when you think about it, some of the Sith artefact are downright dangerous – and shouldn’t be out in the community – the way they can take over someone and turn them into evil is not something that should be let lose. I’d actually love to see Rey get hold of these for 5 minutes – rofl. I think loads of fans would love to see Evil Rey -and it would be a way to do it while not disrupting her character arc, and give just a taste lol. Could be downright fun. Haaaaaa… I can see this would be in the trailers for sure. Whoooo evil Rey in IX! Haaa.. Rey will be on the lookout for a new lightsabre maybe in IX – wasn’t there a light saber in a canon comic that made Luke go all dark and forget himself for a bit? Anyone? @Darth Dingbat wrote: I ordered the Visual Dictionary (haven't received it yet), but alas, I've heard that it's not worth buying. Apparently it's much poorer than its previous counterparts. -Awesome! If you could share any great finds I’d be very grateful! I had a quick flick through it today and the content about the First Light and it’s contents are probably the most interesting to me. Though I’d be curious to read more about Coaxium- I saw there was a double page spread about it. There was also a map I glimpsed - I think it was of something on Correlia - In hindsight I wish I'd taken a photo of it. but it looked exactly like Dr Aphra's electro-tattoo pattern.. and there is suppose to be upcoming content somewhere in star wars where these tattoos are going to be utilised in some way - but which SW content it is not yet know, other than it won't be in Dr Aphra comics. The Dr Aphra comic author was told by story group not to use this story as it was already taken.. I can find the source of that interview if the Dr Aphra tat interests you..
Go Armadeus! Love this fun- imagining all the possibilities! Yeah that ring holding the ‘preserved cell samples from royal bloodline’ is super interesting! We know cloning is possible in SW universe..
Yeah I would put this within the realm of plausibility too! Rofl Armadeus – what mood would the King of Duro be in if he lost his hand?! Haaaa. I love it! Hey, the King of Duro got the skywalker special!! Haaaaa… I thought it was hilarious that technically, Snoke did too! He lost both hands! When having a quick flick through the Solo official guide today I took a quick photo of the singer and the singer in the jar. Rofl. I won’t share the images I took as they are not legal, and it’s against forum rules I figure. But I think I can at least type out the information.. so here goes! A best selling recording artist billed as “Chanteuse of the Stars”. Aurodia Ventafoli is in high demand. Touring makes it rare for her to settle in one place for too long, but Dryden Vos offered a hefty sum to book her for an extended residency on the yacht. He pairs her with a classic supper-club singer. [description of face apparatus: ‘Multi-vocoder boosts her voice to non-human frequencies. First impressions of this tiny Gallusian might not suggest a recording legend, but Luleo Primoc was a chart-topping singer in the years before the Clone Wars. He also starred in a series of holomovies while wearing a dashing humanoid exo-suit. Now past his prime, Luleo is still favoured by retro-collectors and enthusiasts. This level of detail is pretty hilarious!!! And to think, both these singers maybe umm Star Wars Universe Grammy Award winners. Rofl! There is a concept I understand in my heart, yet my logic cannot comprehend it, so I continuously ponder it. The concept - what turned out between Han and Beckett, and then Han later promising Ben that he will do anything to help him...is it a die for his sins concept? (I know there is more to it than that, yet it is beyond my understanding, which is why I love it more! lol) The Annual comic - Han's Blood Debts causes me to feel I am on the correct track, but help me to really understand it more - build the puzzle (I am missing pieces). Help! @SW_Heroine_Journey wrote: There is a concept I understand in my heart, yet my logic cannot comprehend it, so I continuously ponder it. The concept - what turned out between Han and Beckett, and then Han later promising Ben that he will do anything to help him...is it a die for his sins concept? (I know there is more to it than that, yet it is beyond my understanding, which is why I love it more! lol) The Annual comic - Han's Blood Debts causes me to feel I am on the correct track, but help me to really understand it more - build the puzzle (I am missing pieces). Help! There are parallels between Han and Beckett and Han and Kylo. Both Han and Kylo kill a father figure. Both Becket and Han touch their "son's/killer's" faces. Han kills his father-figure because he doesn't trust him because his father betrayed him. We don't know the whole story with Kylo/Ben and Han, but I am pretty sure Kylo/Ben felt like Han betrayed at some level. Han and Kylo both feel bad about killing their their "father". Han shows his upfront, but gets over it, whereas with Kylo it will wreck him on some level forever. But things diverge at the point of the face touch. Becket touches Han's face when he is about to betray him. Han touches Kylo's face because he loves him and because he was willing to give him everything. Han knows that he failed his son. We don't know how much, but we know that he is willing to do anything for him at that moment, perhaps because he didn't give enough to his son in a million moments before. We don't know at this point. But there is an absolute Christ-like moment with Han there, an "I will die so you can be saved." Further it was specifically written in the script of TFA that the blown up SKB is the birth of a "new sun." Change a letter and the "son" is born again. "My son is alive," and will live and be born again because of what Han did. @frolickingfizzgig wrote an excellent meta about the sun/son meaning. But yes, in the end Han is willing to give his life to save his son, hence he is willing to die for his son's sins in that the son's sins and abuse damage have warped the son so much that something radical and extraordinary and selfless needs to happen to knock the son off his bad path. Thank you so very much! I truly appreciate this reply! It's perfect - now everything is wrapped in a nice bow in my mind with logically thinking about it. I saw movie only once but I cant remember did Qi’ra say that to prove loyalty you must hurt someone you love? Or did I dream it? @SkyStar wrote: I saw movie only once but I cant remember did Qi’ra say that to prove loyalty you must hurt someone you love? Or did I dream it? She said that you must sacrifice something you love. @SkyStar She did, when they're trapped by Vos. It's a pretty clear parallel to Ben with Snoke and how he's ordered to kill Han but then turns on Snoke to protect Rey. One thing I still haven't figured out with that scene, if they brought the actual coaxium with them to Vos as a switcheroo after Beckett's departure/betrayal, what was the plan to still get the real stuff back to Enfys Nest if they'd managed to scam Vos? @Man Without A Star @snufkin ah yes, because at that moment I thought how Han clearly understood why Kylo did what he did and that his son still loved him at that moment and that is why Han forgave him and let him prove loyalty to one Kylo thought is worth it. Yet it sounds somehow messed up. @snufkin wrote: @SkyStar She did, when they're trapped by Vos. It's a pretty clear parallel to Ben with Snoke and how he's ordered to kill Han but then turns on Snoke to protect Rey. He did. Han even said so and incorporated the betrayal into his machinations, when he revealed his master plan to Becket and Dryden Vos. 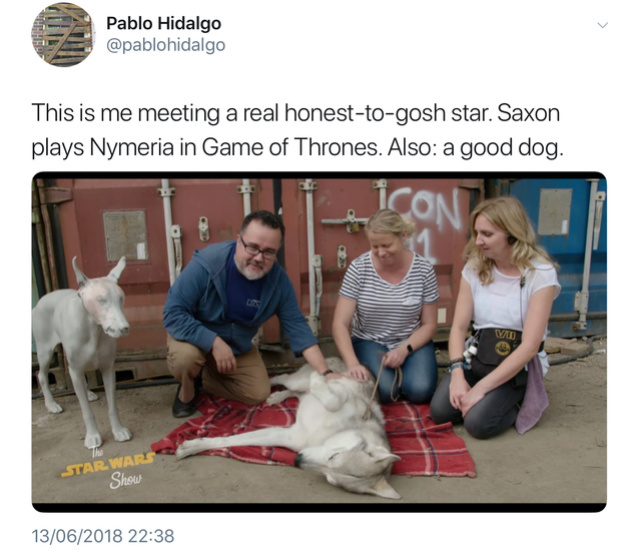 So Saxon from GoT had a cameo in Solo as a corellian hound - I don’t watch GoT btw. I am not too fond of real animals being used in movies especially in scenes like that, but I want to believe Saxon actually enjoys it and is/was treated well - seems happy with PH here. Edit: you can see him in the Star Wars show too and there is another suited up dog, a doberman. I want to cuddle them both. It’s at around 3:10 or so. @SoloSideCousin @Darth Dementor I remember that part of the scene. It's just what were they going to do afterward if Beckett hadn't betrayed them and told Vos about Enfys Nest? What were they going to do next with the coaxium in the room having been handed over to Vos? That's the part I can't quite figure out, how they were going to get it back to the people they'd promised it to? @snufkin wrote: @SoloSideCousin @Darth Dementor I remember that part of the scene. It's just what were they going to do afterward if Beckett hadn't betrayed them and told Vos about Enfys Nest? What were they going to do next with the coaxium in the room having been handed over to Vos? That's the part I can't quite figure out, how they were going to get it back to the people they'd promised it to? If I remember correctly, Han told Becket the plan, or a plan, and when Becket walked away, Han knew that he would betray him. Becket was never just going to walk away. He would either settle with Dryden, or he would take the coaxium for himself, and Han knew that. What I'm going to say is very personal, but I think it's important for me to say it here because it might help others who have been holding out from seeing Solo. The first thing I'll say is that I don't believe in organized boycotts of films, brands and restaurants. I don't believe in shaming people into submission, both the ones being boycotted and the ones who are expected to be part of the boycott by a majority. And for that reason although I have been angry about TLJ from the moment I first saw it, my reason for holding out on Solo was not that that I was participating in the organized #boycottsolo movement. My reason for not watching it until very recently is that I was scared that I wouldn't like it, and of what that would mean for me personally as a Star Wars fan. But I've had a rough few weeks, and I realized that the thing that could cheer me up like nothing else was watching a Star Wars movie at the movies, if that makes sense. So it was more like a leap of faith. I'm happy to say that my faith was rewarded, because I absolutely LOVED Solo. I loved Alden Ehrenreich (sp? )as Han, which was my biggest concern. He is charismatic and vulnerable in a way that is fitting for a young proto-Han, which is what we're seeing here. I LOVED Chewie, and most of all I enjoyed Lando. The portrayal by Donald Glover was fantastic and did the character justice. I could have done without L3, whose presence I endured throughout the movie, but there were so many great things going on that even that couldn't spoil my enjoyment. I've always been a fan of Woody Harrelson, whom I consider to be a very gifted character actor, so enjoying his role wasn't a surprise for me. I like Emilia Clarke very much in spite of not being convinced by her acting in GoT (no offense to any fans of hers, just my opinion), and I was happy to see that she was actually great in Solo. Last year I talked about doing the 23andMe genetic testing kit to learn more about myself. I found out that I am 25% West African, and the remaining 75% is a mix of white European and Native American. My hair naturally coils into tight curls when I let it air dry, but it will become straight if I apply heat from a good blow dryer and then style with a hot iron, so you'd never know what it naturally looks like. I come from a culture where women are told a variety of ridiculous things, like that they need to keep their hair straight in order to be desirable. EVERYONE, regardless of skin color, wears their hair as straight as they can. I was taught from age 12 or so to style my hair into the desired straight texture or a barely acceptable wavy texture, and spending close to an hour fighting with my hair to achieve this (less time if there is less humidity) has been part of my usual routine since then. I was 16 in my freshman year of college. I was immature, torn between outrageous defiance and looking for approval. That summer I took swimming as an elective (not competing, but improving my technique) and because I was wetting my hair with chlorine every day and had a busy schedule I went a few months letting my hair air dry and wearing my natural curls. My hair looked similar to Enfys Nest's, but dark. I heard negative comments about my hair frequently during that period from family, friends, even from strangers - but that only made me dig in my heels even more and I tried my best to blow it off. The thing that killed me was that when I was done with the elective and "blew out" my hair, my then boyfriend said something like "thank God, you have pretty hair again." That was a big blow to my self esteem, and though I don't think about my curly hair being unattractive (the irony is I look better with my hair natural! ), If I'm honest I feel like I've been conditioned to the point where I feel I need to style my hair to maximum sleekness because my natural hair is just not allowed on me. It's to the point where I very much admire this hair texture in others, but don't feel like I can carry it off on myself. It's a mess, I know. With all this in mind, when Enfys Nest took off her mask and she turned out to be an empowered and super cool character that transcends the usual film gender norms -- and who also happens to be a beautiful young girl with hair just like mine, I had a powerful feeling that I can only describe as being acknowledged in a way that the 16 year old version of me desperately needed to be. I'm a grown woman in her 30's and it felt so good to see myself represented in that way that I got a little sniffly. I can only imagine how amazing it must be for little girls, little boys and younger women and men who are of mixed ethnicity to see themselves reflected back on screen like that. And that is SO important. After what happened with Kelly Marie Tran, there is no doubt that representation of minority groups in our films is of key importance. With all the hate and the division in the world I really just think it's key that they write more characters that are representative of the fact that people come in all colors, shapes and sizes. We absolutely need characters that don't conform to the same racial standards that have been upheld unquestioningly on film for so long, even in Star Wars with its brunette girl clone army. Importantly, for me that doesn't mean excluding white actors, but rather creating more diverse characters. I've always felt that racial equality doesn't mean turning against one particular race in favor of others and I believe that preferring one actor over another based on race alone, without taking other factors like talent into account, is the opposite of equality. I feel like in Solo, that was done so well. There was room for everyone, and the movie was better for it. That's just my take on the matter, and I don't mind if others see it differently. Reading that made me feel so sad! And it's almost funny because I have natural very straight hair and I HATE it...I always wanted curly hair. When I was younger. I begged my mother for a permanent wave but she forbid it. So I tried to curl it with different curlers but the locks never lasted Sometimes I still do it and my husband makes fun of me because he knows in less than an hour they become straight again. So yeah, it's a waste of time. Curly hair is beautiful and it's a shame we don't see it more often in movies etc. I'm glad you enjoyed Solo and hope you made your peace with TLJ as well. Haven't commented a ton on Solo, but now seems like an appropriate enough time since Enfys is the focus here. She's totally underrated, I don't see much discussion about her at all. Perhaps because she wasn't in the movie as much? But how much Maul was there either here or in TPM, yet he still became a fan favorite, with his own books, comics, roles in Clone Wars and Rebels, and so on. So what if she sounded much like other Rebellion-leader type people in SW, which is a criticism I've heard. 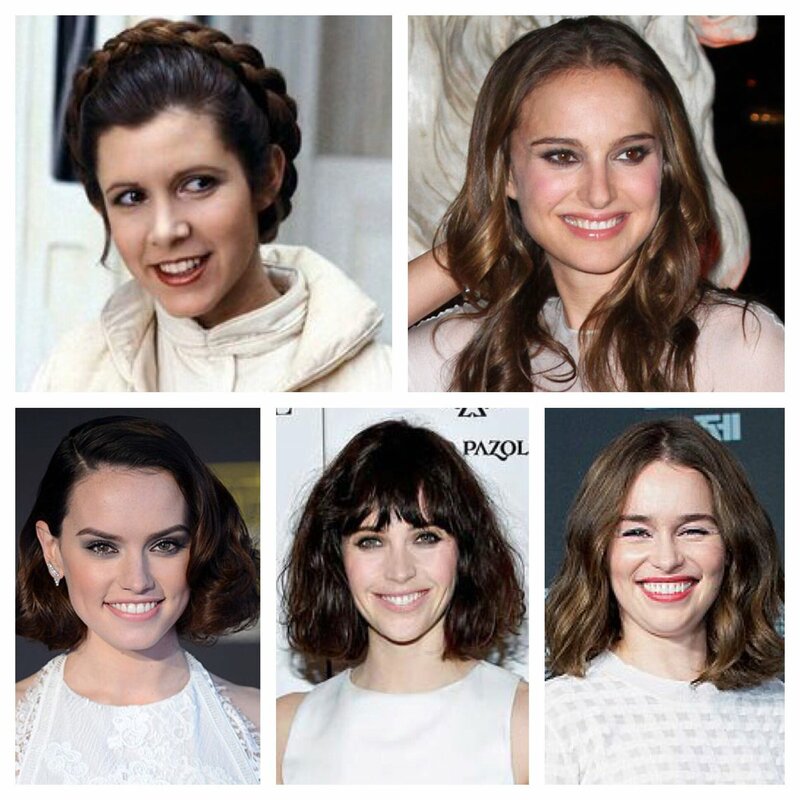 I think it's great she's part of this quasi-lineage of female freedom fighters, from Padme to her to Jyn Erso to Leia to, yes, Rey counts too. The little we saw and heard of Enfys made me want a whole movie or some kind of spinoff EU material about her and her people. The only thing that annoyed me here was the really long dramatic reveal, because.... she's a girl? Most of the female SW characters are fighters, so it just seemed odd, like it was a movie from another time. And the mask and title gets passed down like she's the Dread Pirate Roberts? Awesome. Also she has terrific theme music (go John Powell!). It made me sad the Resistance isn't as interesting as this proto-Rebellion. Also regarding representation, I think Val (and her actress Thandie Newton) deserved better than what the movie gave her. We needed more of her, and the film didn't really do her justice. I'm glad there's a female droid, and many love her, but it was very obvious that L3 was an L&M leftover that kind of stuck out from the rest of the film. I later read it was Miller's idea, based on the "we don't serve your kind here" line from ANH he thought was hilarious. Not sure if she was intended to be taken as a joke or seriously. My worry is that the whole movie felt like that under the earlier management, according to the Kasdans. I also have curly hair, as do my parents and sister, though I was complimented on it. I didn't know that many people (and I suspect it may be a racial/ethnic thing) were shamed or insulted for naturally curly or textured hair. But from my late teen years onwards, I started getting asked a lot of questions about if I've ever straightened it, or that I should straighten it. Like, why does anyone care, and why is this important? At least I wasn't told that from a young age. Also Q'ira is one of the better characters to come out of the recent crop of SW movies. It seems like they were setting up for more adventures with her. I bet she and some of these other characters get spinoff material as the RO characters did. Donald Glover was spot-on as Lando, and Alden and Woody Harrelson were great too, and I haven't seen much criticism of much of the acting from anybody. I do think it was too fanservice-y in some ways, but so was RO and even TFA. I'm glad Yoda told the audience the messages of TLJ, but (unpopular opinion) his appearance also seemed like fanservice. But none of it actually destroyed any of these movies for me. I was also impressed that was no acknowledgement of the force, lightsabers, Vader, the Death Star, the Jedi and Sith, and all those other mystical or cosmically-sized elements of SW. So in that way, it was actually a bit of a new direction it doesn't really get credit for. @Darth Rowan So glad you loved Solo! It's been received pretty well in this corner, it's sometimes hard to remember how mixed the reception was/is elsewhere. One of the first comments I heard on the movie was that it was a welcome change of pace and tone after the heaviness of TLJ and RO. Even TFA was kind of heavy in spots. I can see IX being heavy for a good chunk of time, but I think it needs a happy ending, or there's not much of a point to it all. finally managed to see it! this was adorable in all the right ways and my anxiety about it was unfounded and i adored so many things about it. i'm sad it's received a battering, it's not the most original movie under the sun, but it holds up well enough and honestly doesn't feel like it's been stitched together and reshot and everything. my favourite thing was learning that bradford young was the DP for this because i love how he lit arrival, and he did it again here, especially during the sabacc playing scenes. somehow he manages to make these scenes so intimate. other favourite thing were the indigenous people on the desert planet of fuerteventura (whatever the hell it's called), i have such a soft spot for tiny ancient ladies. costume for bad*** pirate person looked enormously like a princess mononoke leftover in the best possible way and i really hope they did draw inspo from it. i had other flashes of inspo when i saw the trenches on the war planet, or the dystopian correllian child labour camp or whatever the hell it was. it sort of all plays like a best of good creature design and location scouting fantasy stuff, and i'm all here for it. would love sequels just so i could hang out with these guys some more. especially lando and his f***ing cape closet and why can't i have a lando movie with just him going cape shopping. that is all. i like how much howard respects lord/miller. Yes, in every interview and article I've seen him mention Lord and Miller, he always says that they were great, and that he loves the influence they had on the movie (30% of it is theirs, after all). Also interesting that he mentions JJ giving him a bit of advice as well. JJ was hired for IX just a few months after Ron Howard was for Solo. @californiagirl i didn't pay a lot of attention, so i completely missed that. i still kinda want that lord/miller star wars movie, pls??!! Starwars.com update on Solo DVD release and special features..
Hi All! There's Solo movie news! DVD release and special features!! I guess this is USA release date and us fans not in the US may not have the same release date, still, it's cool to see the special features!